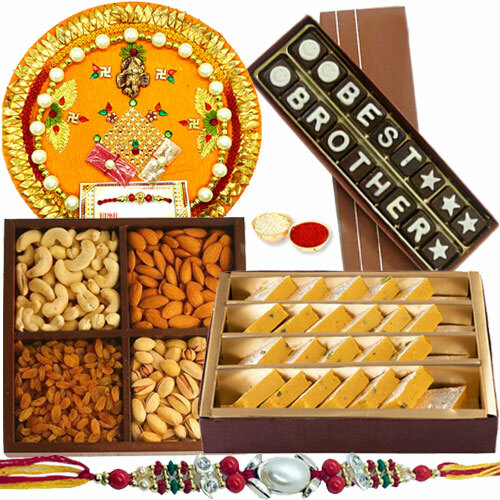 Deliver your lovely wishes for this Raksha Bandhan along with this Astonishing Gift of Badam Barfi from Haldirams, Mixed Dry Fruits, Homemade Chocolate and Shree Thali teamed with a free Stone Rakhi, Roli Tilak and Chawal to make it memorable forever. The gross weight of the Badam Barfi and Dry Fruits are 250 Gms. The formation of the Rakhi may comes with alteration as per availability.